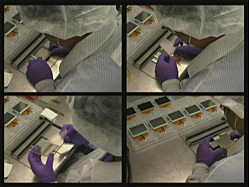 Resistive Touch Screens – most widely used due to cost and reliability. Typically constructed using layers of conductive polyester film and glass. Requires activation pressure to make physical contact between the conductive layers to generate an XY axis point. Inherent internal reflections may reduce high ambient light performance. Sunlight readability can be improved via antireflective coatings and layers of linear and circular polarizers to minimize internal reflections. Common configurations and include 4-, 5-, and 8-wire. Surface Acoustic Wave – SAW uses ultrasonic waves that register where the touch is located. As a portion of the wave is absorbed, it sends a signal to the controller. Because it requires very low activation pressure, a SAW touch screen can be susceptible to surface contamination or damage. Projective Capacitive Touch Screens – PCT is becoming increasingly popular due to its very high resolution. Projective capacitive technology relies on a capacitance change that occurs when touching near or on the sensor surface. 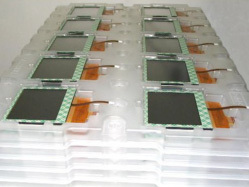 A conductive grid is patterned on the glass surface and forms an XY array. Applying voltage to the array creates a grid of capacitors. The array is connected to a controller that converts analog to digital signals and locates the exact contact point. PCT’s excellent resolution enables multi-touch applications. Infrared Touch Screens – operate using an array of infrared light emitting diodes (LEDs) and photo sensors to locate X and Y coordinates. The touch location is identified by the interruption of the IR beam. 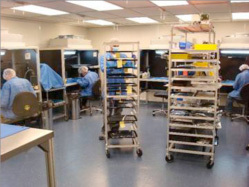 IR touch screens provide very good optical clarity and can accommodate very large displays. Resolution is dependent on spacing of the IR sensors; false activation can occur due to surface contamination. High ambient light that produces IR radiation may reduce the sensitivity of the IR sensors and, therefore, touch screen functionality. Optical Imaging Touch Screens – a relatively new technology that uses optical sensors on the corners of the touch screen and infrared backlights to create a two-dimensional field. Touches are detected as shadows, and interpolation occurs to pinpoint the location of the field disruption. OI technology is scalable to large display sizes. Linear or Circular Polarizers – reduce internal reflection to less than 2% by orienting reflected light to separate it from light emitted by the LCD. 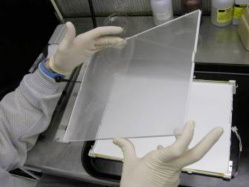 Glass Front Resistive Touch Screens – to improve surface durability to abrasion and chemicals for touch screens used in rugged environments.